My books are my canvas. I like intense colors and dynamic forms that pass through the time and space of my art. The sculptural dimensions of books, plus the fourth dimension of time as the pages are turned, balance variation and continuity. Books are secrets shared between us, waiting to be touched, opened and discovered again and again. I invite you to hold my world in your hands. Figure 1: Barrio del Sur (Barrio y Calle series), UCLA Library Special Collections. Barrio y Calle - individual books and the Calle Sin Sombras and House of Cards series. These books are inspired by urban streets and neighborhoods. 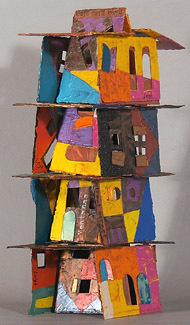 Figure 2: House of Cards 08.04.08 (Barrio y Calle series). 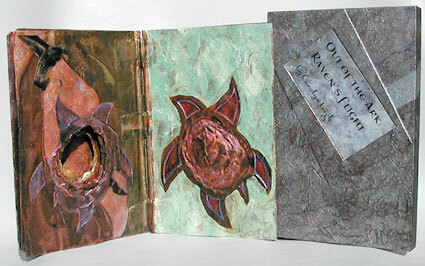 Out of the Ark: Raven's Flight and Land of the Dove - two series of artist's books based on the Biblical story of Noah's ark. Figure 3: Out of the Ark: Raven's Flight. Painted Faces: Nightfall Faces, Primary Faces, Harlequin Faces - three series of miniature books about the changing perceptions of spirits and their significance in human culture. Figure 4: Primary Faces (Painted Faces series). 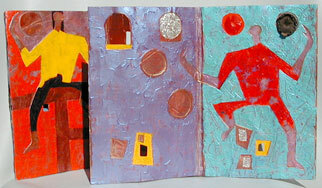 Portals on Camino de Oeste - limited edition, collaborative work with Paper Portals, Book Artists' Collaborative. Figure 5: Portals on Camino de Oeste, an award-winning work based on a walk by the 6 artists in Camino de Oeste Wash, Tucson Mountains, AZ.